For construction to begin successfully, effective floor preparation is a must. By harnessing our modern fleet of preparatory equipment and years of industry experience, we can ensure the highest standards of cleaning and preparation necessary before installing your preferred flooring system or to begin a construction work. Our dedicated machines and an array of preparation techniques leave your asphalt or concrete floor absolutely smooth and ready for work. Floor preparation is dust-free and creates minimalist disruption. If you have a floor that needs removal of screeds, concrete laitance or paints, we have you covered! We have a variety of diamond floor grinders, dust controlled machines and other handheld equipment that are capable of effectively removing all particles and efficiently smoothing and levelling the floor before any construction work begins. Being a recognised commercial and industrial floor preparation company, we strive to deliver the best services to our clients. Therefore, we harness encapsulated vacuum blasting technique which is the industry standard for floor preparation. It is a highly efficient, all-encompassing and environment-friendly technique that is performed within enclosed circuit for dust-free execution. The technique does not require any chemicals or water and is capable of delivering a superior surface. It promises 99.9% dust free preparation and provides a high-quality surface profile for Polyurethane floor paints, Epoxy resin floor coatings, sealants and floor screeds. We also use other floor preparation methods such as diamond grinding, scabbling or concrete planning and vinyl & latex removal. We have a team of highly skilled technicians who have years of experience in each of these preparation techniques and promise to deliver superior quality and exceptional services. We use diamond floor grinding technique to remove existing coatings, latex and adhesives from the surface; re-level concrete and asphalt floors; smooth floor undulations before new installations or construction. Concrete floor planning, flailing, scabbling and cold milling helps to remove contaminates and screeds, re-level concrete surface and provide anti-slip flooring. 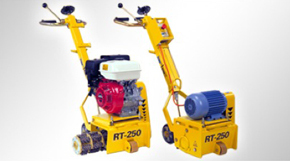 We use machines of different size and capacity to suit all kinds of project. Our floor planing service is most appropriate for engineering workshops, warehouses and facilities, refurbishment of old concrete floors, laitance removal, cleaning and texturing granolithic floors and removal of old coatings and contaminants. For an expert consultation, contact us on 08009750891.